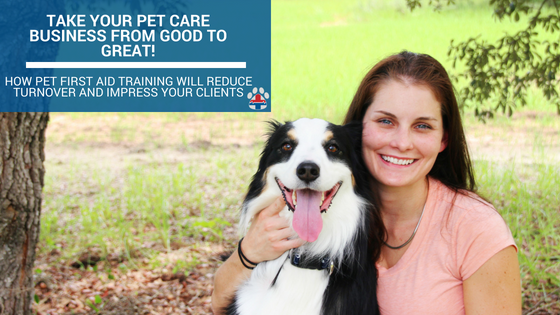 As a pet care business owner, making certain your staff are properly trained and knowledgeable about safely handling your clients’ pets can seem overwhelming. 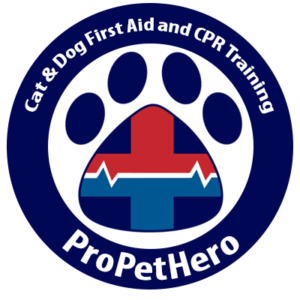 Thankfully amazing tools like online pet first aid certification have been created to make your life easier but you have to use them in your business in order to reap the benefits. As the year presses on or even maybe just beginning, you may be thinking to yourself that you got lucky without having a pet incident – or did you? Did you add to your ever-growing to-do list that you would make certain you and your staff knew what to do during pet emergencies? One of many ways to help retain staff and impress your clients is to provide them with the education they need in order to feel confident in their job and provide the best care to your clients. While training new hires on your standards is certainly a major part of that equation, another crucial piece is training your staff for pet emergencies. Being able to inform clients that you and your entire staff are equipped with the knowledge to help recognize and act when their pet has an emergency is not only a major selling point to them, it’s a competitive advantage for your company. As a pet owner, that impresses me. While I could rely on my neighbors to let my dogs out or feed my cat when we travel, I cannot count on them knowing what to do when my dog chases the frisbee one too many times and passes out or when my cat eats the bag of bread – including the plastic! While technology has certainly made life easier for many, most importantly it has given all of us access to ER veterinary instruction. ProPetHero is making it easier to get your staff trained by adding a group purchase feature, which not only makes allocating the registration streamline but also automatically discounts any order of 5 courses or more. Did you know that we test all of the students’ knowledge retention? Now you can make sure that not only did they take the course, but they walked away with the knowledge you paid for! Now is the time to let your clients know that you truly have their pets’ wellbeing as your top priority. Become their pets’ hero and learn how to save their pets when you and your staff have time and at your own pace. ProPetHero was founded on the principle that anyone can become a pet’s hero as long as they possess the knowledge to do so. Waiting around for the next class is not efficient for business or practical for staff who needed pet safety skills the second they start handling animals. The days of organizing your staff’s schedules to take a course, or trying to convince an instructor to make a special trip out to you are over. Enroll yourself and/or your staff now at ProPetHero.com. Take a step forward this year, no matter what time of year it is, the longer you care or send staff out to care for animals without knowing how to handle emergencies, the closer your company gets to an emergency happening. Your competition is as hungry as you are and this is a great way to show your clients that you’re a leader in the industry. Stand above the neighbor listed on Next Door, the other person listed on Thumbtack, Wag or Rover. Business owners always ask us to save them time and money, we’ve done both. I’d hate to see a pet suffer under your care because you didn’t have the right training in place. Do you want to take the crucial step to protect your company and most importantly your clients today? Sign up – it’s super easy, way quicker than you think and if you have a staff of 5 or more, learn how to access our company dashboard and save money while doing so here.